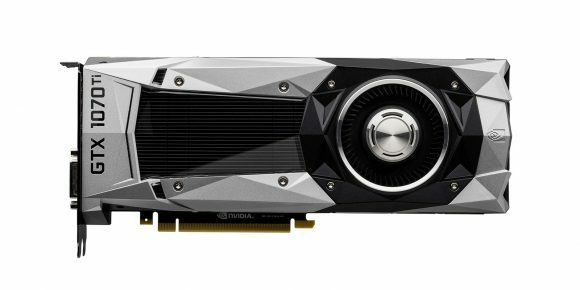 A couple of days ago Nvidia has announced their new Geforce GTX 1070 Ti series of video cards and has opened pre-orders with the shipping and official sales expected to start tomorrow in most regions around the world. Prior to the official release there were a lot of speculations about what the new GTX 1070 Ti will be offering and we already know that the new Ti model is actually not that much different. Nvidia probably did not want to endanger the sales of their GTX 1080 GPUs, so as one might expect the GTX 1070 Ti sits somewhere in between the GTX 1070 and GTX 1080 in terms of performance, though with overclock it will most likely be able to outperform the GTX 1080. There are some speculations that the new Ti will be overclocking pretty well and that is definitely good news for both gamers and miners. Let us take a quick look at the more important specs and how GTX 1070 Ti differs from the 1070 and 1080 GPUs from Nvidia (reference designs and clocks). 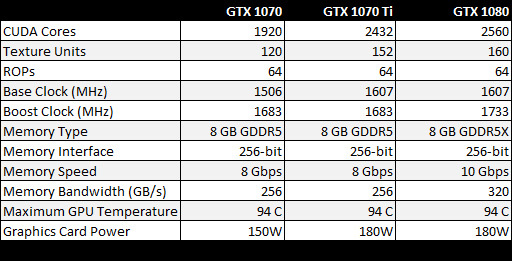 Looking at the specs comparison it seems that the new GTX 1070 Ti is almost the same as the GTX 1080 as far as GPU specs go (some extra clock should compensate for the less CUDA cores) with the biggest difference being the memory being used. The GTX 1080 uses the faster in terms of speed GDDR5X video memory and offers more bandwidth, but the memory timings are slower compared to the slower in terms of operating frequency GDDR5 used in the GTX 1070 Ti. While for gamers the memory latencies might not make that much of a difference for users and the faster frequency might be fine, for miners the memory timings are more important. So the GDDR5 memory used on the GTX 1070 Ti is good news for people mining memory intensive altcoins such as the ones using Ethash like Ethereum for example. Do note expect however to get much higher performance on these compared to the regular GTX 1070, in fact the new Ti should most likely get you a bit better performance in more GPU intensive algorithms due to the increased number of CUDA cores. Of course we’ll need to do some testing when the new GPUs are finally out on the market and see how good their performance compared to the old GTX 1070 and the GTX 1080, but we already have a pretty good idea on what to expect. Do note that although Nvidia is using photos of a reference design GeForce GTX 1070 Ti with a Founders Edition cooler it seems that such a model is going to be only directly sold by Nvidia and not through partners, all other designs are non-reference ones with coolers already used for the GTX 1070 or 1080 models. As a result many people will not be ale to get their hands on the Founders Edition due to the fact that Nvidia does not have good distribution channels of their own and thus the company essentially ignores direct sales in many of the smaller markets around the world. Anyway, we already know that the new GTX 1070 Ti should be a great choice for multi-GPU mining rigs instead of the GTX 1070, although the deciding factor will most likely be the end user price of the new video cards… a price that is also expected to be somewhere in between the GTX 1070 and GTX 1080.